We have recieved the below article from a resident of a tower block in Coventry following the tragic fire at Grenfell Tower in London. Please read and share this important article. The disaster at Grenfell Tower in London, where a fire ripped through the 24-storey tower block early last Wednesday morning leaving a death toll which now stands at 79 and is expected to rise, is a damning indictment of the greed and profit-driven capitalist system. It has long been clear that working class lives have never been held in anything but contempt by the capitalists and their representatives, and now – not for the first time – they have blood on their hands. The exact cause of the fire is not yet known. But the use of flammable cladding to plaster the outside of the building is believed to have been a major factor in turning the entire tower block into a deadly inferno. This is the same cladding that is banned for use on buildings above 40 feet in the USA, and is classed as a ‘flammable’ material in Germany, despite conforming to UK regulations. What is even worse is the fact that the fire-resistant version of the cladding would have cost developers only £5,000 extra to use – that is, £2 more per square metre than the flammable cladding they did use. Residents of the tower wrote in November 2016 that “only a catastrophic event … an incident that results in serious loss of life … a serious fire in a tower block or similar high density residential property” would lead to changes being implemented by their landlord. They were ignored. They have now been proven right, in tragic circumstances. This has left the government in complete disarray – with May refusing to meet residents because of “security concerns”, and even having to admit that “support on the ground for families who needed help or basic informatiom in the initial hours after this appalling disaster was not good enough.” This stands in stark contrast to the way Jeremy Corbyn actually met with the residents, and who is demanding that Theresa May promise a full, independent and meaningful public enquiry into the disaster. This contrast is not lost on residents and the friends and relatives of those affected – as shown by the scenes of the angry questioning of Tory MP Andrea Leadsom when she visited people as to why the Prime Minister and other senior Tories had not visited them, whilst Jeremy Corbyn did. The Grenfell tragedy has been one long in the making. Gavin Barwell, Theresa May’s newly-appointed Chief of Staff, who was the Housing Minister before the election, actually delayed a review into fire safety in high-rise apartments. It is also worth remembering that back in 2012, The Independent reported then-Prime Minister David Cameron’s intention to “kill off safety culture”, declaring that “we need to realise, collectively, that we cannot eliminate risk and that some accidents are inevitable”. This abhorrent contempt and lack of value for working class lives shows itself starkly with the promise from Theresa May of a £5million emergency fund for victims – the rough value of a single terraced house in Kensington, one of the richest boroughs in the country! It has also been reported that the flammable cladding was used to help improve the view for those living in the nearby luxury houses. We have said that they have blood on their hands – this was an act of corporate murder, and the shocking lack of health and safety standards has worried many people across the country, concerned at just how safe their own homes are. Here in Coventry, WM Housing (which owns Whitefriars) has revealed that just two of their 24 tower blocks have a sprinkler system installed! Living in a Whitefriars-run tower block myself I noticed they quickly put up some fire safety notices inside the ground floor entrance a couple of days after the Grenfell fire. They also put a leaflet through every letterbox which confirmed our tower block did have a sprinkler installed – but in the immediate vicinity there are a total of 3 tower blocks which they also maintain. As WM Housing have said only 2 tower blocks across Coventry have a sprinkler, it begs the question as to why only one or two tower blocks out of three in the same area may have one! The failure to have properly sorted out even these simple and surely basic standards up until now does not fill me with confidence. When I moved into the flat there weren’t even any smoke alarms installed! 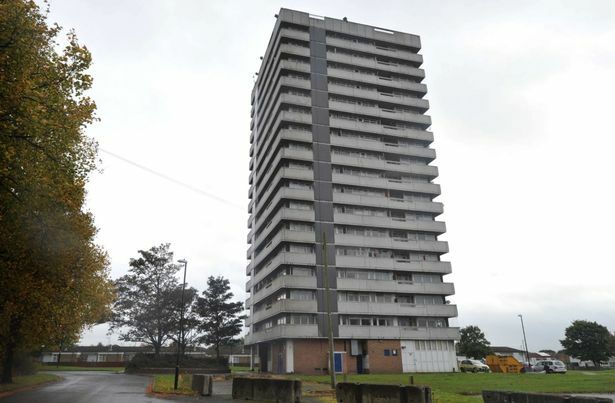 Coventry Council has confirmed that it will be carrying out safety inspections in tower blocks over 6 storeys tall. However, they have exempted Whitefriars-run blocks from the inspections because they “have already provided assurances to the council that their buildings are up to the relevant fire safety standards”. Assurances are not good enough – all blocks should be inspected, along with other public buildings, to ensure they meet safety standards. Landlords in the private rented sector should also be forced to ensure their properties are safe and fit for human habitation. We cannot afford a system which treats our lives with such contempt, and gives them so little value in comparison to those whose interests it was created solely to represent. We must have a break with this system – the capitalist system, driven purely by profit and greed, a system which looks after the interests of big business and the 1%. We must fight for socialism – to change society and run it in the interests of working class people, under whose democratic control the economy and industry would be planned. Anything less will eventually leave us with a repeat of the Grenfell tragedy. Justice for Grenfell – get the property developers and Kensington Council in the dock. Reverse fire service cuts – fund our emergency services properly. End the pay freeze. Inspections and a full review of safety procedures across housing, council buildings, schools, colleges and universities in Coventry. All tower blocks and schools should have sprinkler systems installed. Campaign for all housing, private and social, to meet safety standards. No cutting corners for profit. Organise for action, rent strikes and walkouts if our safety can’t be guaranteed – no safety means no work, no rent and no school! Do you agree? Get in touch!